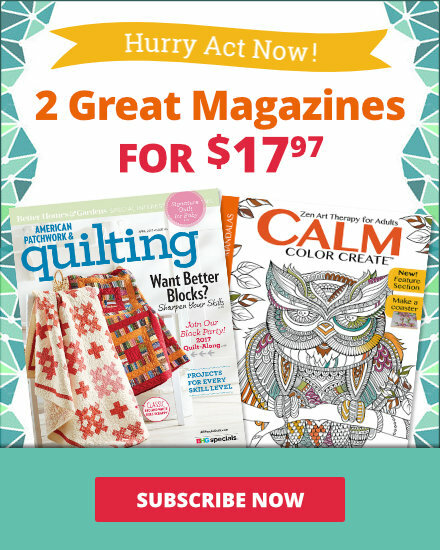 See the featured quilts and web-exclusive color options and projects from the American Patchwork & Quilting June 2014 issue. 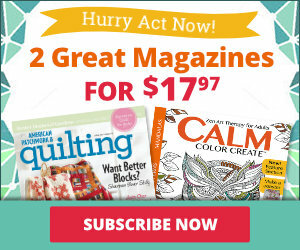 The June 2014 issue of American Patchwork & Quilting is on sale from April 1--June 3. Missed it? Order a digital issue here. Designer Weeks Ringle of Modern Quilt Studio shares her remedy for common "problem" fabrics, offering advice for what may ail a quilter's stash! Get the digital issue here. Did you miss the first Stash Rx story? Read it here. With the addition of a clever sashing, a field of stars emerges from a serene Irish Chain background. Swap the lights and darks for a pop-art version of Out of the Blue. Two primary motifs emerge depending on your viewpoint. Do you see dark four-petal flowers with a Four-Patch at the center? Or do the light four pointed stars comes to the forefort for you? Florals are perhaps the ultimate multicolor prints. A simple rule of thumb for combining other colors with a realistic floral print is this: mix in some leafy green. The hint of gold in the block centers frames the Four-Patch in each block. Learn the secrets to applique success layer by layer from the designers who built this quilt. A switch to fusible machine applique turned this version of From the Ground Up into easy street. 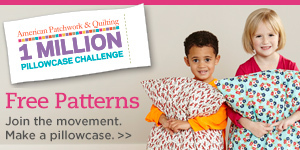 This quilt plays with fabric textures such as stripes, dots, florals, and damask prints. Use plush fabrics to piece an easy throw that takes advantage of the 58" width of the fabrics—it’s the perfect easy-to-make gift! 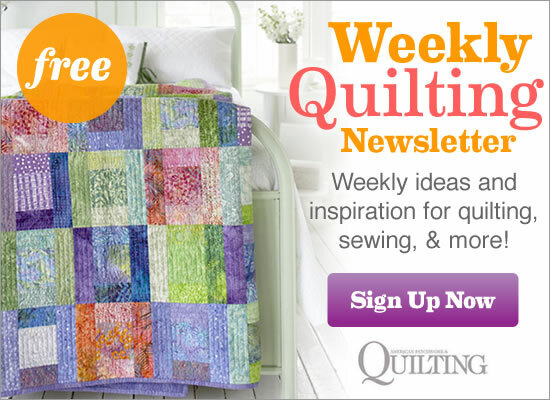 Get the free quilt pattern here. It may look like an extraordinary labyrinth of patchwork rectangles, but the eclectic mix of prints on a solid earth-tone field is really three ordinary sets of rectangles repeated row after row. An all-batik Regular Joe echoes a vertical half of the original quilt. Though the rows are shorter, this quilt stays true to the shifting rows emerging from the pattern center, which makes the rows appear to be water rippling away from a shoreline. How do you keep one-color quilts from being ho-hum? When pulling fabrics for a monochromatic quilt, don't forget to pull all the shades of that hue. Not only do the vertical rows look like stairsteps, but each fabric appears to stairste across the width of the quilt as well. Conventional wisdom might lead you to think that brights must be paired with other brights. But adding a dull putty color to this mix provides two things: a resting point for the eye and a balance to the busyness of the bright. Retro prints bring pops of color against the neutral background. This quilt uses only the center portion of Regular Joe. Flying geese units set the stage for small, straight-set blocks that appear to be set on point in a classic black-and-white quilt. Medium-tone reproduction prints sparkle in a table topper that’s perfect for any season. Batiks, wovens, and ikat, oh my! Mixing textures. batiks, wovens, and prints in a single project instantly ups the interest level of this quilt. With raw-edge fusible applique you can quickly assemble the perfect pillow for your sewing space. Celebrate this hobby with a confetti-print background and a fussy-cut printed sentiment at the base. Elizabeth made the sewing machine from black fabric and narrowed and slopes the machine's head to look like an old Featherweight. I wish I may, I wish I might, make this super scrap-lover's delight. In this antique quilt, patchwork stars flicker across a shirting field. Add some sparkle to Count Your Lucky Stars with a selection of bright pastel tone-on-tone prints that contain a hint of metallic. Seemingly mismatched prints come together beautifully in this table topper. In the Pinwheel units, bright fabrics peek through a solid background. Pairing color after color with a two-tone background of gray and off-white is a solid idea! Use a braidlike method to make uneven chevrons. Gray has won its way into the hearts of interior deisngers. Are you unsure how to work gray into your home? How about with a fresh mix of blues and yellows? Use a narrow color palette of two brights (purple and pink) and two neutrals (black and white) to produce a bold wall hanging. Happiness is handmade. Stitch an homage to that sentiment with hand-pieced Spool blocks surrounding a hand-embroidered center. For a standout addition to your sewing space, choose a novelty print for the wall hanging center and surround it with Spool blocks in bright prints. The small scale of the pieces cut from a large-scael print is just right for this version of Spoolin' Around. Like a spectacular fireworks display, stars pieced from an assorted of prints burst from the center of a patchwork throw. Punch up the color palette with a variety of fiery batiks. A shimmering star in the middle radiates red, yellow, and orange. A delightful white plus 1930s prints version might well be hiding something. If you focus your attention on the four white centers of what appear to be Square-in-a-Square blocks with 1930s print corners, it's easy to lose sight of the star formed in the four corners. Consider these beyond-the-basics stitches when you're ready to embellish a project. 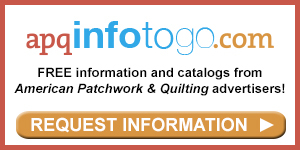 Get the first five 2014 issues to learn 10 embroidery stitches. A project in the December 2014 issue will incorporate the year's stitches.